I used it WHILE in combat and it didn't dispeled. I was on the last boss of The Everbloom. My Œuf de goren chaud was hatching into this after 7 days. 5min duration and you can roll around like a Goren. You can get this item from Œuf de goren chaud after 7 days. Puts me in the mind of a young Krogan, by the looks. This became my favorite toy when I found out what happens when you run while this item is in effect. Seems to be giving a 50% speed increase too. Neat. Combat removes it though. Just got it from fishing in inland open water (not a pool) in The Undergrowth, Spires of Arak. Had fished 1.201 Enorme grangousier des abysses and Croissant-sabre énorme before finally getting this item. If anybody needs a little bit a clarification on where exactly this egg cave is, I made a quick video for it right here. 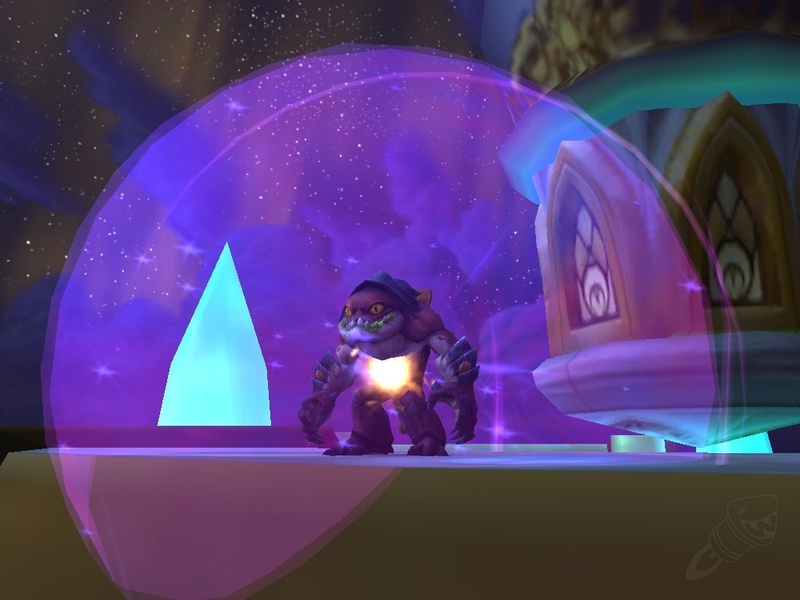 Fun fact: Goren Garb stacks with Ghost Wolf, giving you 180% movement wolf! RUN DOG RUN. Atleast is has the same casting and /sit animation. Keep rollin' rollin' rollin' rollin' rockin'. If you use Moire ciel d'Ai Li with this, then you are able to keep the transformation while in battle. Plus you are a glowing translucent goren. Super cool. This is great for mining in your Garrison Mine, combine with the Shamanstone speed buff + Miner's coffee and you'll have 180% movement speed! "TRANSFORM AND ROLL OUT!" <class>s in disguise! This is typically how I exit my garrison to drop Blingtron 5000. While you can mine ore in your garrison mine while in this disguise, it will not fool a real Goren, so you can still get attacked by Goren. Miner's Coffee and Preserved Mining Pick work while under the effect of this toy. Can get Atours de goren from Œuf de goren chaud after 7 days of waiting (100% chance). Stealth nerfed to no longer give a speed boost as of 6.1. Goren Garb + Shadowform + Darkmoon Ring Flinger = Sonic the Hedgehog! This is awesome for tricking people into PVP on PVE servers. I just get my rogue to stealth near busy mine nodes flagged for PVP. Once a horde starts mining I pop the Goren Garb and they think I'm a spawn and attack. The garb drops and I can kill them. Easy honor lol. I know it's evil.